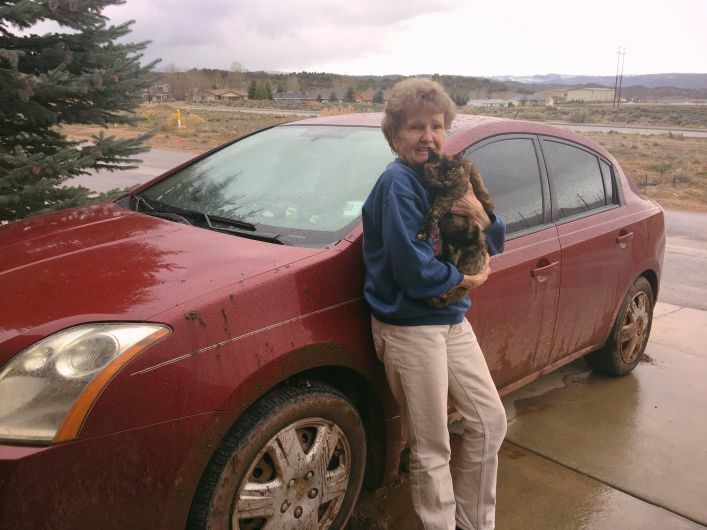 Ruby Stein, 85, is pictured with her cat Nikki and her 2007 Nissan Sentra. Self-described “farm girl” Ruby Stein from Akron, Colorado, took a wrong turn on her way home that nearly ended her life. For about 20 miles, 85-year-old Ruby Stein wrestled her 2007 Nissan Sentra up an unpaved, steep mountain road south of Gypsum. She was lost and searching for Interstate 70 after taking a wrong turn while trying to beat a winter storm home. Alone, with no one in sight and only a backcountry skier’s tracks around her, the steel-haired woman then found herself stuck at a dead end. Stein tried to rev her tiny maroon vehicle back and forth, as she had learned from years of ranching on the Eastern Plains, but her car was swallowed by mud, snow and ice as her cat Nikki looked on with a curious stare.